GCell today announced the Solar Powered Keyboard FolioÂ for iPad Air, the worldâ€™sÂ first energy harvesting keyboard folio for iPadÂ® Air 2. The BluetoothÂ® wireless keyboard uses solar technology to harvest indoor and outdoor light energy into a rechargeable battery. 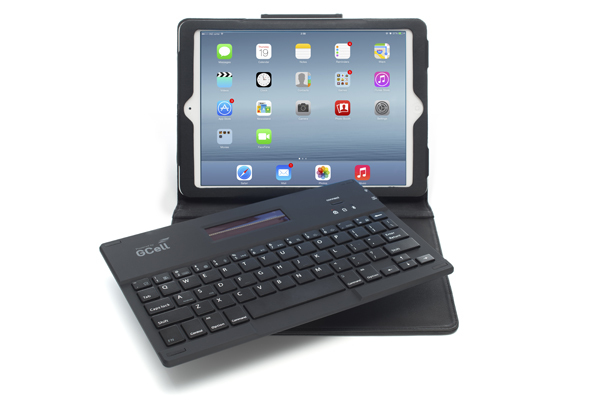 The convenience offered by the GCell keyboard allows users to type with an iPad from the home, at the office or during the daily commute without need to change batteries or revert to a mains powered charger. The design has been focused on providing a contemporary, thinner streamlined and lightweight profile, popular with users of wireless keyboards. This ultra-portable keyboard weighs only 235g, is less than 6mm thick and has a lavish silicone-paint finish giving it a silky feel. The GCell keyboard is compatible with iOS and Android operating systems. It is also programmed with â€˜Hot Keysâ€™ allowing the user to perform repeated key functions quickly and conveniently. With a high-quality scissor-key structure every keystroke gives tactile feedback for an improved typing experience. The plastic photovoltaic cell is robust and shatterproof meaning it can be used without fear of breakage if dropped. It is also incredibly thin, this helps create an ultra-thin keyboard design that is aesthetically pleasing and ergonomically friendly allowing the user to type with more comfort and less strain. The keyboard comes complete with a luxurious black folio to protect the tablet whilst maintaining its portability. It has been sized to fit the popular 9.7â€ tablet sizes including the latest iPad Air 2. The keyboard and folio are magnetically connected allowing the user to physically detach the keyboard from the folio for use and pairing with other iOS or Android devices such as smartphones, meaning users can text or update social media more easily. The GCell Solar Powered Keyboard Folio will be launched at Energy Harvesting & Storage USA in Santa Clara November 19-20, and is expected to be available through retailers in the U.S. and Europe in December 2014. To buy directly click here.